We began our Goose Pond Road business in 1989 as a small family workshop, specializing in Shaker style and country furnishings adapted from 17th and 18th century antiques. Since then we have expanded to include design and construction of contemporary furniture. Like the early craftsmen, we create one-of-a-kind pieces to satisfy individual needs. 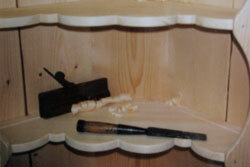 Time has proven that traditional joinery methods successfully serve both the craftsman and the owner. These skillsincluding hand-planing of boards, mortise and tenon joinery, and dovetail jointsassure both quality and durability as well as simple beauty. Like the originals from which they were inspired, our reproductions are handcrafted primarily from native wide pine boards. However, our other creations include Shaker furnishings and contemporary designs that are more appropriately constructed of cherry and other hardwoods. Meticulous attention to detail allows us to realistically reproduce the marks of wear and use evident on even the best preserved antiques. This care in construction and detail must be similarly complemented in the finishing process. In keeping with the tradition of many 18th century pine pieces, we offer authentic milk paint finishes and can mix pigments for custom colors. For unpainted furniture, we have developed a staining process that highlights, rather than masks, the natural beauty of the wood's grain, and brings out the warm color tones characteristic of fine antiques. Equally important and complimentary to precision joinery is a fine hand rubbed finish. Whether painted or stained, our work is then completed with one of several hand rubbed finishes chosen appropriately for the desired look and necessary protection. The natural process of aging, or patina, is the result of years of sunlight, oxidation, waxing, rubbing and use. It is only with much time and effort that a hand rubbed finish can match the mellow glow we revere in fine heirlooms. We are committed to that effort, and feel that our aging process, an art form in itself, adds character and warmth to each piece. In a world where mass production is prevalent, we are committed to a philosophy of small and personal: to serve our customers' individual needs and provide uncompromised quality in our craftsmanship. We proudly sign and date each piece of furniture, for each is an investment, a family heirloom to be appreciated for many generations. Since a picture is worth a thousand words, please visit our Custom Furnishings Photo Gallery. 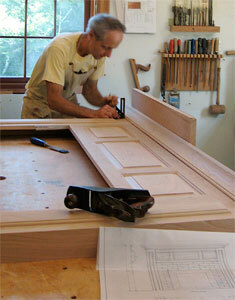 Call Jim today, 603-795-4346, to discuss your custom-designed hand-crafted heirloom!